Race 11 wasn’t as exotic as race 10. After my long flight back from Argentina on Thursday, I decided to keep it simple and run the Zimbabwe Run One Mile race on Sunday. 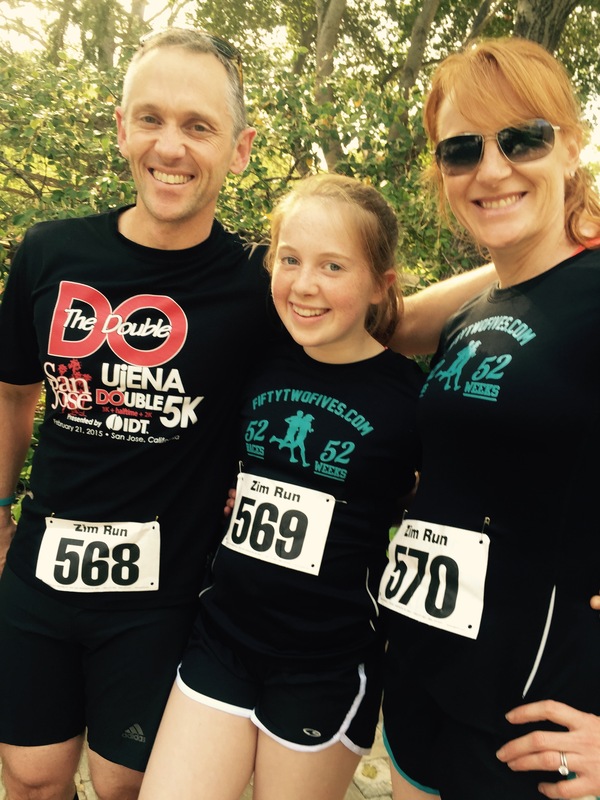 My youngest daughter ran it the past couple of years, and this year I ran it with my wife and eldest daughter. Family running is great fun — what’s better than spending time with your family and getting some exercise in too? Family fun at the Zimbabwe Run. Hugh, Lucy, and Selina. The girls have their new fiftytwofives.com shirts! Watch the video above to get a feeling for the race — this is my eldest daughter Lucy in action, running in the seventh and eighth grade girls race. (Click the HD icon at the top for a better viewing experience.) We’re very proud of her — she’s taken up running in the past year, and grown to love it. The Zim Run is unique and for a great cause: it’s a fundraiser for orphans in Zimbabwe. As you’ll see in the video, it’s mostly on grass and two loops around St Joseph’s school in Mountain View. It’s run in age groups: first and second grade, third and fourth grade, and so on up to high school and post high school. The good thing about running one mile is that it only takes between 5 and 8 minutes for most people run regularly. Mentally, it’s easy to say to yourself at the half way mark that the pain will stop in three minutes and to keep going. I was whispering encouragement to myself after 3 minutes. You can’t do that in a 10k or a half marathon. Anyway, I came about seventh or eighth (the results aren’t available yet). I ran the race in 6:20, which isn’t too bad given the course, and isn’t too good given it’s a mile. The winner ran it in around 4:30. I beat my wife by about 19 seconds (that’s important!). But, most of all, we’re very proud of Lucy’s efforts! It’s a great family event — I might see you there with your family next year. We’ll be there. So, what about next weekend? I’m glad you asked. I’m looking for a race to run on Saturday, and I know I’ll be running the Wildflower Run in Morgan Hill on Sunday. Might see you there! Previous PostWeekly update: we’ve raised $22,099!Next PostWeekly update: We’ve raised $22,149!